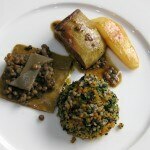 This past weekend, the 6th Festival International de la Gastronomie was held in Mougins, France. Over eighty chefs from all over the world made the trip to the south of France to showcase their cuisine during Les Etoiles de Mougins. The highlight of the three days was Sunday’s chef competition. During the first step, five chefs were selected from a list of seventy: Francis Ogé (a cook in the kitchen at the Elysée Palace), Filipo Fiorentini (Arnolfo restaurant, Italy), Nelson Da Silva (Le Loom, Seignosse), Jessica Largey (sous-chef at David Kinch’s Manresa, Los Gatos, Calif.) and Olivier Jean (Le Métropole, Monte-Carlo). They had two hours to prepare a “foie gras cuit servi chaud avec une garniture libre autour de la courge butternut” (warm cooked foie gras with butternut squash based garnish). To make it harder, at the last minute, the jury introduced a mystery ingredient: lentils. Watch the exclusive video above to follow the competition. It is long (over 10 minutes), but you will have all the details of the exciting and stressful afternoon, including the members of the jury (where chef Eric Frechon of Le Bristol was the president), and a word from Richard Galy, the mayor of Mougins. 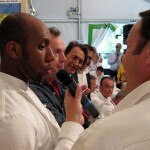 You’ll also see me talking to the winner, Francis Ogé, and his dish: dôme coulant de butternut en habit automnale, foie gras poëlé sur un duo de légumes et fruits. Congratulations! ﻿﻿The competition was incredibly close. In fact, the two top chefs received equal scores for their dishes. It was up to the “Jury Cuisine,” composed of Serge Gouloumès (Le Mas Candille, Mougins) and Sébastien Chambru (Le Moulin de Mougins, Mougins), who were in charge of judging the two-hour preparation and execution of the dishes, to break the tie and make the final decision as to who won the overall contest. You can click on each photo to enlarge. All photos and videos by Sophie Gayot.